Great book. Easy to understand and a great fun way to start drawing. * Jo Udall * This book was given to me to review and I found it to be very pleasing. I've tried drawing manga before now, and own several "How to books" by various authors, so was very pleased to receive this one to review. The book starts off with a short introduction about what Chiblis are and an explanation on how to understand the drawing stages that has been used in the book, to aid you in drawing them, followed by some recommendations on what to use to draw and colour each character. I would personally recommend this book to anyone who enjoys drawing manga or anyone thinking about trying to learn how to draw it, as its gives you plenty of guidance and clear stages on how to draw these cute little characters. 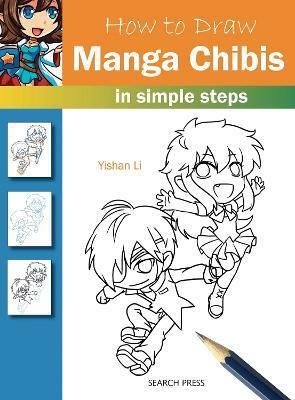 * Kelly Biss * 'How To Draw Manga Chibis' is a simple, yet very effective book which can help start you on your way to drawing brilliant manga figures. The book features very little text (apart from the first page) which makes it a very easy to understand book. There are plenty of figures (28) to practise drawing and these can be adapted to create your own manga chibis. Each page shows roughly seven or eight drawings, right from the basic circles and lines to start with, each picture then adding more detail next time. I haven't really tried drawing before I had this book and have practised using the figures in the book. I am very pleased with how simply it is set out and none of the pictures seems overwhelming. It is an A4 sized book of 32 pages. It is informative and well worth a try. * Kaiserin Maggs * My stepson is a big Manga fan, and was trying to start drawing his own characters, this book, with its step-by-step illustrations has really helped him to improve. The book itself, with the eight-stage technique, is really easy to follow, even for beginners (I had a go myself! ), and I'd recommend it for anyone wanting to have a go at Manga. * Susie Wilkinson * I got this book with my 11 year old in mind. He loves to draw and is always practising. This book shows lots of different manga figures to draw broken down into simple easy to follow steps. My son loves it and has expanded his drawing skills. * Lisa Mayles * I received 'How To Draw: Manga Chibis' last month and it really is a great way of showing you how to get started when it comes to drawing manga characters. The book is made up almost exclusively of step-by-step figures which, in my opinion, is the best way to teach someone how to draw. I mean, who can learn to draw from superfluous paragraphs of text? !